Satan is so tricky. 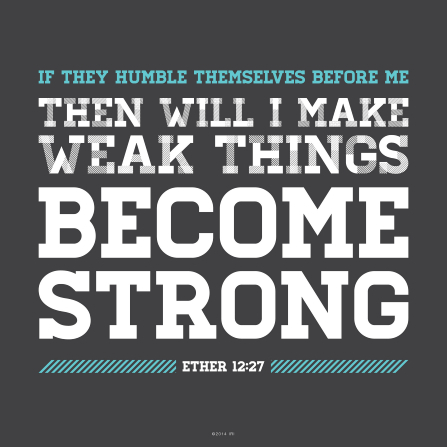 I can’t believe how often and seemingly easily he can tempt me to turn my strengths into weaknesses. He tempts me to turn my gift of persuasion into manipulation. He tempts me to turn my ability to command attention into becoming the court jester. For every strength I have Satan has shown me just how easily it can turn into a weakness, usually in a way that appeals to my pride, and at times I’ve stumbled and succumbed. This is not something I’ve seemed to have very much success at. This morning, like a bolt of lightening, it dawned on me that I’ve has an extremely narrow view of how this process works, therefore limiting my success in accomplishing the task. All this time I’ve been looking for Heavenly Father to correct or reverse my weaknesses. Although it is possible and sometimes necessary for it to be done this way, of course using the atonement of Jesus Christ, it is a very difficult process. We do not always have to reverse our weaknesses to make them strengths, but change how we use that specific trait. I truly believe that recognizing that I don’t always have to wait for my weakness to make a 180 degree turn to transform my weaknesses into strengths will significantly speed up the process of doing so. As we learn, through Christ, how to use our weaknesses to serve Him, they are no longer weaknesses, but mere imperfections. Things that have no sin attached, but merely a sign of our mortality that will be corrected with our perfect resurrected bodies, making that day of resurrection all the more glorious to each of us individually. I am so excited for that day! What does it mean to be a hypocrite? My favorite part in this whole post is the willingness to keep a weakness, and the humility it takes to ask how to make it a strength. When I was a youth I would pray fervently for instant massive changes in myself. I would go to bed and pray to be totally different when I woke up. Of course those types of prayers are not answered in the way we hope. As an adult I have never considered that I could keep a weakness and still have it be strong. I always imagined the weakness would have to be removed first. I love this, now I have a whole new way to approach this!